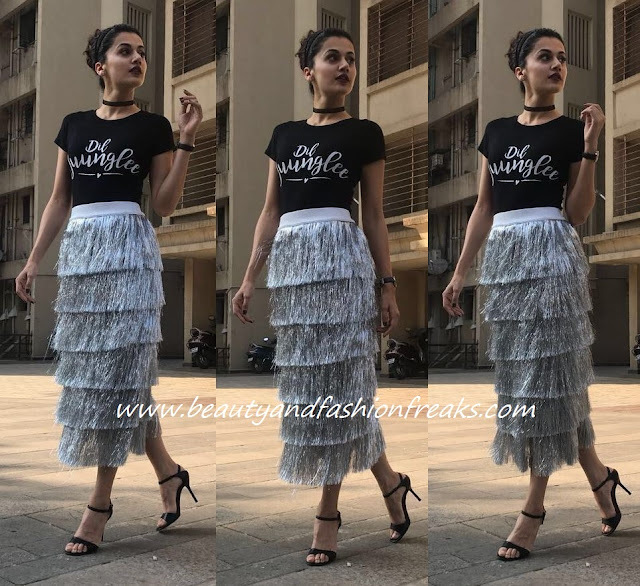 Taapsee sported a black tee with tiered fringe skirt from Madison while at the trailer launch of her upcoming movie Dil Juunglee. Wearing her hair up, she rounded out the look with a pair of black ankle-strap sandals, a choker, dark lips, and a wristwatch. It was a look Ms. Pannu wore really well, she looked nice! I love her skirt! So fabulous! OMG!!!! i am totally in love with that skirt!! !